Before getting involved in the excavations, it is important to get an overview of topography and history regarding the project. 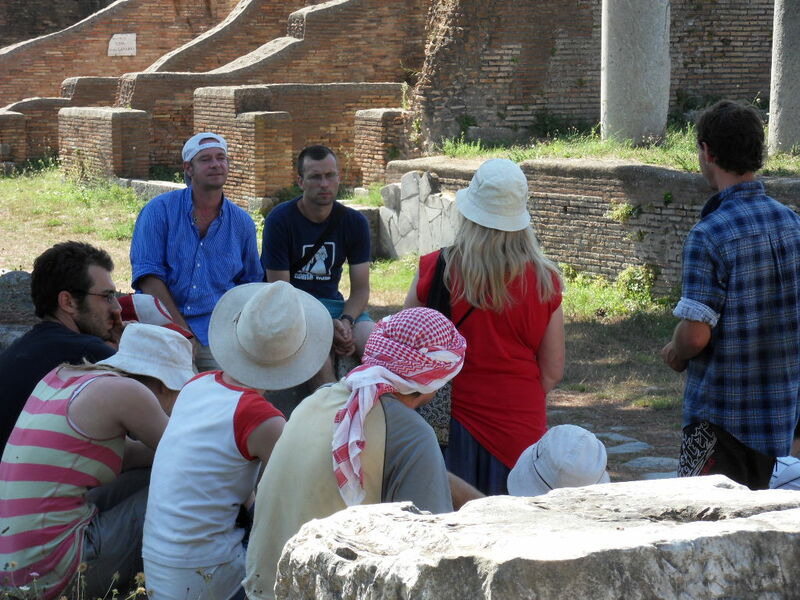 Axel Gering provides a generel introduction into the development of Ostia at the camping site. 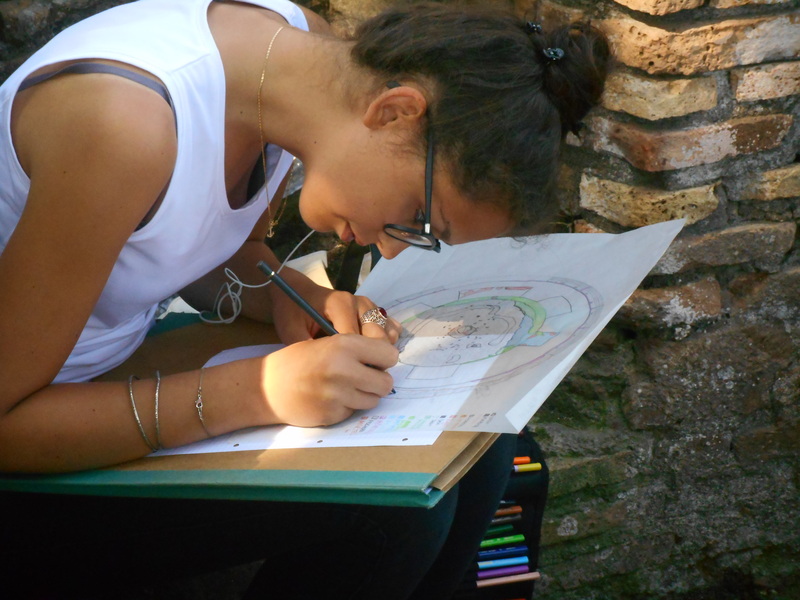 All students can develop their skills of drawing, measuring, and classifying finds a.s.o. 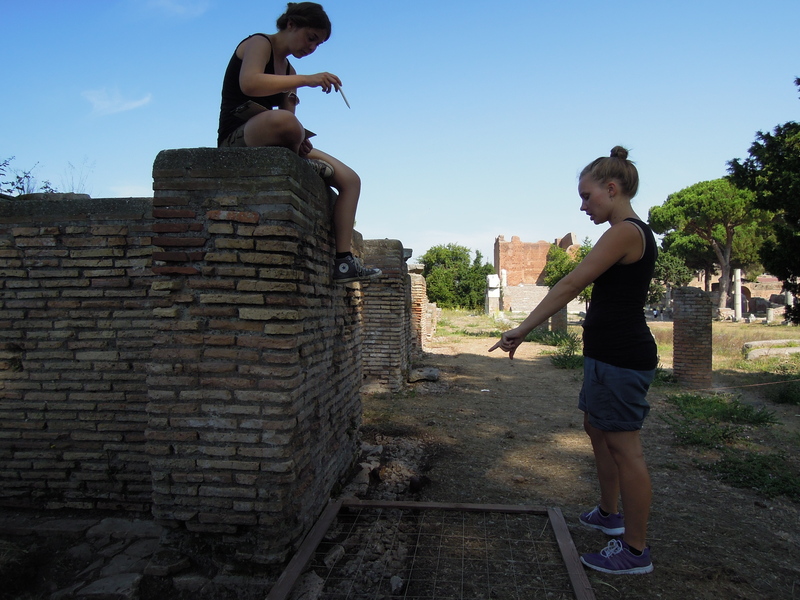 A basic experience of previous excavations is required, but everyone can choose their favourite area(s) of interest and talent. Extraordinary lessons are held by our specialists and cooperation-partners too. They can introduce their aims and methods, for example laserscanning, geophysics, aerial photography, or the software and databases used for documentation. 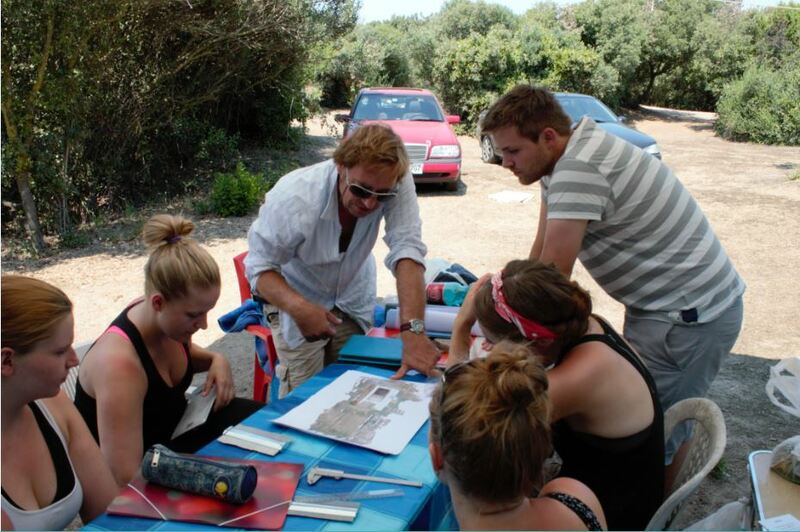 Bernhard Strackenbrock from the German Aerospace Center (DLR) showed in 2010 to students how the laserscanner works on site under extreme wheather-conditions of August-heat and sandstorm (see picture below). Christian Krug, an experienced photographer from several ancient sites in the Near East, introduced us in 2010 to the techniques of aerial photography with his tiny quadro-copter, which worked very well even in the hardest wind thanks to Christian’s flying-skills (see picture below). 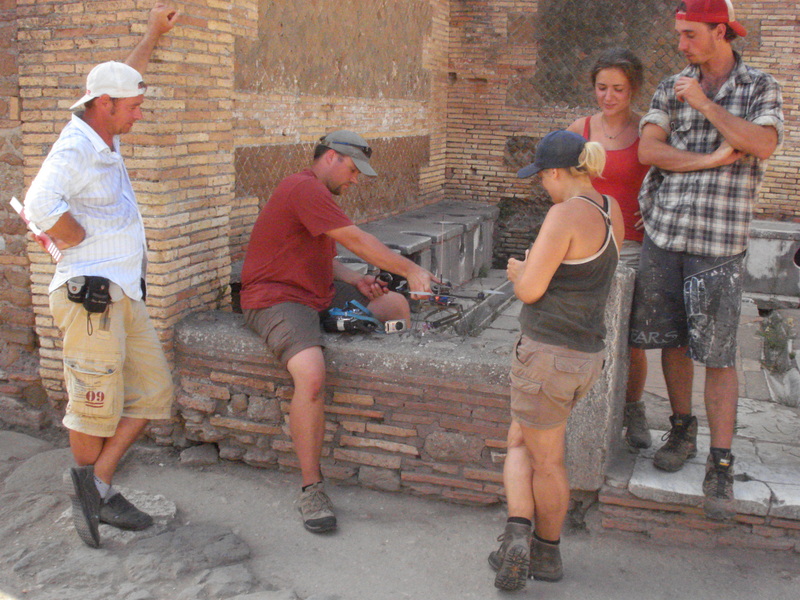 Classical measuring and drawing by hand is still many students’ favourite choice of work on site (see picture below). Even though we are using a completely digital documentation-system, it is always good to prove the accuracy of the 3-D-modelling by hand-drawings, which are often surprisingly exact. Measuring with grid-frames (see picture below) is normally done in teams of two people. One uses measuring equipment, while the other one has the overview and draw at the same time. Fortunately there are some comfortable walls to sit on to get an overview. Of course we only choose walls with a sufficient amount of modern reconstruction and mortar so we do not touch and damage the ancient brickwork. Measuring with a Total-station seems to be the most professional way nowadays, but by re-measuring the grid-system by hand (see picture below) we found quite often that the good old Pythagoras (a2 + b2 = c2 ) can show us human measuring-mistakes (of course machines never fail, unless it runs out of battery). The drawing of finds takes place in the deposits on site. Especially in the August-heat it can be a pleasure to share the workplace in an airconditioned room with mosquitos having the same fear of heat. The students draw bigger finds in a 1:1-scale, which requires some time (see picture below). In some midday-breaks, there is the opportunity for the whole team to see famous monuments and sites in the other parts of the city too. 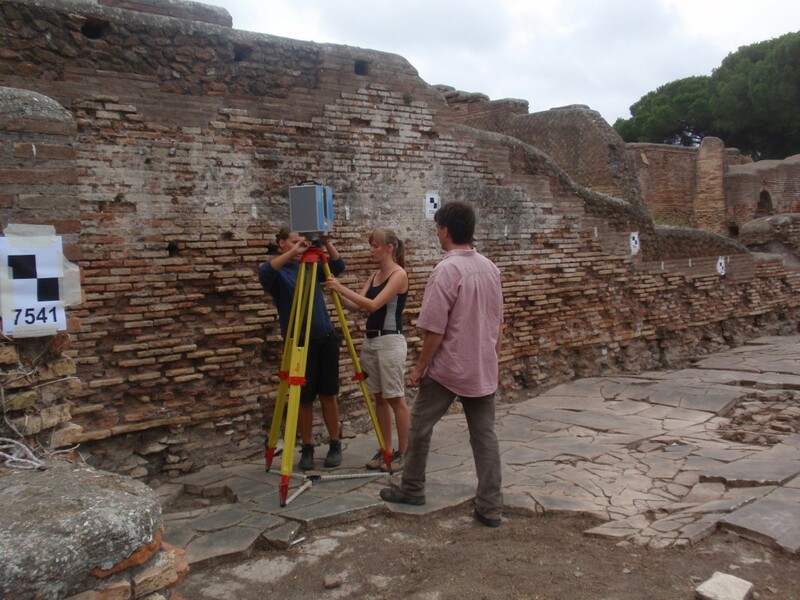 Axel Gering explains the scientific works of other teams working in Ostia, and sometimes we have the chance to visit excavations of colleagues. It is impossible to see the entire city in one midday-break, of course, so Daniel Damgaard and Alex Whitford offer supplementary excursions around the city for volunteers on selected days.